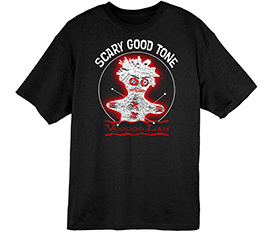 Celebrate thirty years of killer tone with a Voodoo Lab 30th Anniversary t-shirt! This 100% cotton Hanes tee is as black as your soul and so comfortable you'll be ready to windmill or buzzsaw all night long. SCARY COOL SHIRT! A striking shirt with the Voodoo Lab logo and mascot in red and white. This tagless 100% cotton Hanes shirt wears well and resists fading. Ultra-light 100% cotton jersey, contoured fit and preshrunk for great fit, wash after wash. This soft tagless Hanes shirt wears well and resists fading. *If you prefer a looser fit, order two sizes larger than you ordinarily wear, or order the Voodoo Lab Women's T-shirt in your regular size. SCARY COOL HAT! 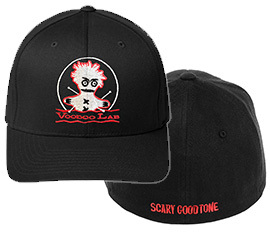 Voodoo Lab logo on a Flexfit wool-like texture fitted cap. Perfect for keeping the sun out of your bloodshot "late night gig" eyes. Comes in two sizes, both in roadie-approved black with red stitching on visor edge. SCARY WARM HEAD! 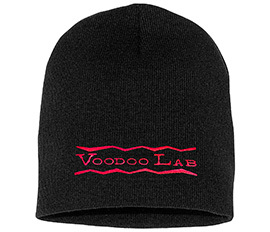 Voodoo Lab logo in red on this cozy short black and red beanie. Beanie comes in one-size-fits-all sizing. 100% acrylic.